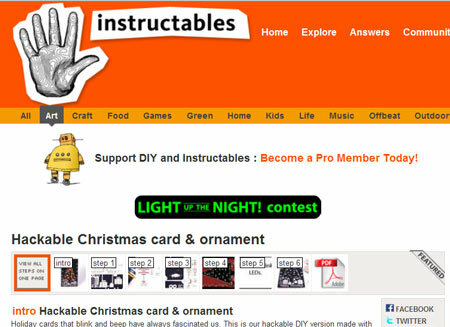 The Instructables version of the Hackable Christmas card & ornament is up. Seeed has copies of the card as a surface mount kit for $12, or assembled for $15. The card is already being manufactured so it can be delivered ASAP. The Seeed stock numbers aren’t accurate, less than 100 are being produced and we’re almost out of the assembled version now. This entry was posted on Friday, November 20th, 2009 at 8:04 am	and is filed under Holiday. You can follow any responses to this entry through the RSS 2.0 feed. You can skip to the end and leave a response. Pinging is currently not allowed.